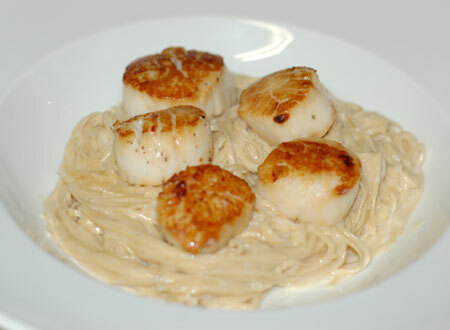 Last night’s dinner was seared scallops with rosemary beurre blanc and taglierini. The timing on this dish was the most important bit, because everything was really quick-cooking and needed to finish at about the same time. It’s one of those meals where it’s really best if Jeremy and Freyja stay well away from the kitchen, because if I even have to think about them while I’m cooking, they’ll be in my way. I started by making the pasta dough. The recipe called for ¾ lb of fresh taglierini, which works out perfectly with my standard pasta recipe from Marcella: 1 C flour and 2 eggs. I decided on a whim to try out the white whole wheat flour’s affinity for pasta, and used only that. The dough that came together was on the stiff side and a bit hard to knead, so I added a bit of moisture by just wetting my hands and continuing to knead. That worked perfectly, allowing the dough to loosen up just a touch without getting gluey. I divided it into four pieces and ran it through my pasta machine up to nearly the thinnest setting with no problems at all, then laid the sheets out on a towel, just barely touching, to dry a bit while I worked on the rest of the meal. The next step was making the beurre blanc. Got my last shallot chopped and everything reducing and ran out back to cut a sprig of rosemary from the garden. I upped the amount of sauce by 50% because some of the reviews indicated that there wasn’t enough sauce for them, and I am a bit of a sauce fiend myself. That, however, meant that I was short ¼ C of cream, so I added in some half-and-half with no ill results. While the sauce reduced, I got some water boiling for the pasta and cleaned the scallops. I was a bit worried about the quality of the scallops because there was quite a bit of milky liquid in the package with them. Jeremy picked them up from Costco and thought they would be fine because they felt firm, so I just rinsed them off and piled them up on paper towels to dry off as much as possible before searing. When the beurre blanc was reduced and ready for the addition of butter, I moved that pan to the back burner, tossed in the butter, and quickly heated a skillet for the scallops. I don’t have a large enough non-stick skillet, so I used my stainless one and plenty of olive oil. They did stick a bit, but not too badly, and I got a decent sear on them, so it all worked out just fine. This is where the timing got really critical, though. The scallops only needed 1-2 minutes per side; I did them in two batches because of the size of my pan. While they cooked, I finished the beurre blanc and quickly ran my half-dried pasta sheets through the cutter. We’ve had trouble with the narrow cutter in the past because the dough would just all meld back together when it came out. Most of the time it came apart just fine in the water, but still, a nerve-wracking moment. This time, the sheets were just dry enough that they separated into perfect delicate noodles. I separated them on the towel as they came out, and when I finished cutting the heap, I ran back over to turn some scallops and take the lid off the boiling water. The noodles got unceremoniously dumped from the towel straight into the water for a quick bath, and I removed the last of the scallops from the skillet. A quick stir of the beurre blanc and a squeeze of lemon juice, and the pasta was ready to drain and toss with the sauce. I plated it up in nests, plunked some scallops on top, and there was dinner. It was very tasty, and despite the flurry of energy required to cook all these items at once, it was also a rather quick meal to make. The scallops may have suffered a bit from my lack of attention, but they were a lovely golden brown on top and not rubbery, which is always my greatest fear when cooking them. The beurre blanc had a lot of flavor, but I think I must have used a heavy hand with the vinegar, because it was more acidic than I had anticipated. Still, it didn’t separate, and had good rosemary flavor without the pine needle texture because I just tossed in a whole sprig and removed it at the end. The white whole wheat pasta was wonderful, and I’ll definitely use that flour for pasta again. The dough was really durable to work with; I’d recommend keeping the sheets on the thinner side so you don’t end up with leathery pasta. But they cooked up beautifully, and didn’t look or taste at all of whole wheat… a good way to sneak it in. And you could get a more delicate pasta by using half white whole wheat and half AP flour. In an 8-quart kettle bring 7 quarts of salted water to a boil for pasta. Remove tough muscle from side of each scallop if necessary. Rinse scallops and dry thoroughly with paper towels. Make beurre blanc: In a small heavy saucepan, simmer wine, vinegar, shallot, garlic, and rosemary until reduced to about 2 tablespoons. Add cream and simmer until liquid is reduced by about half; remove rosemary sprig. Add butter all at once and cook over moderately low heat, swirling pan constantly, just until creamy and butter is incorporated. (Sauce must not get hot enough to liquify. It should be the consistency of hollandaise.) Remove pan from heat and stir in lemon juice and salt and pepper to taste. Season scallops with pepper. In a 10- or 12-inch heavy skillet heat a tablespoon or so of oil over moderately high heat until hot but not smoking. Arrange half of scallops, without crowding, in skillet and cook, undisturbed, 1 to 2 minutes, or until undersides are golden brown. Turn scallops over and cook, undisturbed, 1 to 2 minutes, or until undersides are golden brown. Transfer scallops to a bowl and keep warm. Cook remaining scallops, adding more oil if necessary, in the same manner. Meanwhile, cook pasta in boiling water until al dente (about 30 seconds for fresh) and drain in a colander. Transfer pasta to a heated bowl and pour sauce onto pasta. Add any liquid accumulated in bowl of scallops and toss. Divide pasta among heated plates. Arrange scallops on top of pasta and garnish with herbs, if desired.